The Iraq inquiry headed by Sir John Chilcot has already lasted six years and cost £10million. A source close to the inquiry told us all this June it is ‘unlikely to be published for another year at least’. It’s gone on so long that most people have just forgotten it exists. But, like Gordon Brown, who, in an astonishing piece of British-style institutional nepotism appointed the members of the committee, it occasionally hoves back into view reminding us that somewhere in the shadows they lie undisturbed by troublesome notions of transparency, accountability or law. One such moments has just snapped us out of this cynicism-induced lethargy with an astonishing leak from Colin Powell that appears to prove Tony Blair backed military action a year before seeking a vote in parliament. The document shows a disjuncture between Blair’s public position in early 2002 that he was doing everything he could to avoid military action and the opinion of the White House that the PM would “follow our lead”. These two realities are irreconcilable. 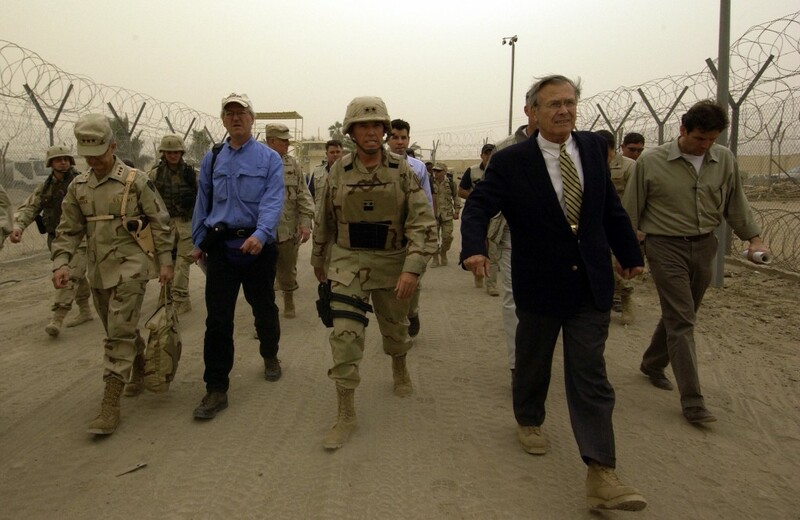 The Powell memo says: “On Iraq, Blair will be with us should military operations be necessary. He is convinced on two points; the threat is real; and success against Saddam will yield more regional success.” Both turned out to be myths, the former perpetuated by the Blair regime’s own propaganda unit. From the memo Blair emerges as a sort of Global Spin-Doctor for the Bush regime. The memo from Powell (March 2002) tells Bush that Blair would “present to you the strategic, tactical and public affairs lines that he believes will strengthen global support for our common cause”. That’s some special relationship. The reality is Tony Blair supported the war 12 months before it began and he’s been lying about it ever since. It’s important not to succumb to the weary cynicism of a hundred British establishment inquiries characterised by vast cost and the inevitable subsequent white-wash distortion and cover-up. As the truth emerges despite the efforts of failed former regimes to suppress it, it’s important to maintain the pressure for transparency and accountability. The Iraq disaster has affected foreign policy ever since and destabilised the entire Middle East bringing increased threats and violence to us all. It’s not a disaster that can be swept away just with time or ongoing spin. Just as Wikileaks and others have exposed the reality of Cheney’s involvement in torture – we need to expect full disclosure and not give-in to a world where our leaders act above the law in our name. That’s not the hand of history on your shoulder Tony, it’s the Old Bill. The Westminster ethos is secrecy and obfuscation. Despite parliament forbidding it,Cameron has already committed British forces to the conflicts in Syria. Democracy is just a sham as far as the British state goes. It’s difficult to maintain integrity when all aspects are apparently rigged. What are the chances that Cameron will have invaded Syria before Chilcot is published and then the Report will be held over for an appendage? I think the first minister summed up cameron on Syria, “he wants to be seen to be doing something”. There is a five or more way civil war in Syria, in addition there are religious differences, US is bombing, France is bombing, Turkey is bombing, Russia is bombing, there are foreign fighters, IS, the infrastructure is destroyed, crop have failed, people are starving and people are fleeing for their lives. And the solution to this according to cameron and the tories is for the uk to join the bombing. The stupidity of this beggars belief, turning rubble into smaller rubble and stocking up potential extremism at home. What will it look like in 50 years looking back on the past two and a half decades of Western involvement in the Middle East? Bombing, killing, plundering, greed, oil and a horrible legacy of hatred towards the West. Who benefited other than large multinationals and arms manufacturers? Certainly not the people of the Middle East. As for the Middle East envoy, I have always wondered how he and his fellow cabinet members at that time sleep at night? But probably the more important question is why did this happen, starting with Iraq, I’ll not hold my breath for Mr Chilcot to find the answer. They couldn,t invade the”barras” never mind Syria,they get chased out of everywhere. POLL: SHOULD TONY BLAIR STAND TRIAL FOR WAR CRIMES? In November 2011 the Kuala Lumpur War Crimes Tribunal convicted Bush, Blair, Rumsfeld Cheney and others of war crimes – the Tribunal included a retired US Federal Judge. Chilcott is rigged – Blair’s cohort, Gordon Brown having appointed the Committee – not an independent inquiry – just a very expensive whitewash. He could of course have both backed war if necessary in 2002 and tried to prevent that war by diplomatic means and not make it necessary in the same year. The contradiction that the Daily Mail and Alex Salmond see here might not exist. You mean if the Yanks would thole that? Judge: Having considered all the evidence I find you guilty. However, before sentencing you please take away and peruse the evidence yourself then come back and give me your opinion. Take your time, no hurry. Several years later – Accused: It wisnae me! Judge: In the interest of balance and fairness, I now find you not guilty – you are free to go. Blair supported military action to secure regime change in Iraq even before 9/11 – he publicly admitted this several years ago. And yes, both he and Bush should be prosecuted. Agree with above posts……and then could we also have an explanation that somehow justifies what the chairman and committee members are being paid!!!! When the government asks me for information they give a strict time limit to respond, usually with penalties for failure to comply. How come those involved in the Chilcott enquiry seem to get an open-ended time period for their responses? As I understand events – this e-mail and its contents emerged from a US Court decision related to Hilary Clinton having documents such as this on her “private” server. Unlikely therefore, that the Chilcot enquiry would be aware of its existence until now, given its relevance to the US and not the UK. If that is a correct assumption – it not only begs the question of how much relevant material is beyond the reach of the Chilcot enquiry, but whether at its conclusion the Chilcot enquiry will confirm that fact – namely that despite everything they may have seen or been made aware of, there was material (of which this e-mail is a clear example) of which they had no knowledge. One Donald Rumsfeld summarised the situation perfectly: There are known knowns. These are things we know that we know. There are known unknowns. That is to say, there are things that we know we don’t know. But there are also unknown unknowns. There are things we don’t know we don’t know. Yes, indeed, there are things we don’t know we don’t know – and therein lies the hidden truth, and the dead bodies and carnage of war. Except that firstly, as the Guardian report cited in the original post points out, it’s an open secret that Blair tilted towards war from 2012 (and that Chilcot would already be aware of this) so no big revelation there, and secondly that, as Monty points out above, there’s no inconsistency between backing war “if necessary” while simultaneously seeking diplomatic means to avoid it. I make this point as a longstanding opponent of the Iraq War. I’m anxious to see the Chilcot Report published. At the same time, there’s no wonder it’s taken six years, given the relentless political point-scoring we’ve seen in the meantime including, I’m sad to say, Alex Salmond’s latest interventions. He seems to imply that the Chilcot Report should now be delayed until such time as the Powell memo can be considered in the light of other evidence. At this rate we’ll never get to see it. The Murderous American neo-cons are the biggest threat to our planet, and our westminster poodles are hanging on to their coattails. There are known knowns – the Chilcot Enquiry will not give the answers we know. There are things that are known knows, but we will never be allowed to know. The Establishment is nae daft. I was in USA in August for work (musical – had a great time). I took the opportunity on several occasions to ask people I met about the “special relationship” which UKGov is always citing. None of them had heard of it. It is a BBC Popaganda meme only. We must pressure for Chilcot’s Report. If it is a whitewash then we must determine to call it out as such and refuse to allow the matter to be swept under the carpet. What is at issue here is the reality that thousands of Iraqi children have been blown to pieces because of the conceit and immorality of Blair AND his backers. Who exactly were they? They need to be held to account just as he has to be. We must also refuse to allow British bombing of Syria. It is apparent that the British establishment thinks it can kill people with impunity. What saddens me is the apathy of the general public to either not be bothered or to be taken in by the mainstream media that this was a ‘just war’. I include myself in that description. While many here talk about Syria, the fact is that we have a much more relevant case that illustrates directly the dangerous spin we all fall victim to and that is the situation in Ukraine. The US has been funding right wing neo-nazi groups for decades in Ukraine for years through NEDS to the tune of millions of dollars. The US for decades now has wanted Ukraine to become members of NATO and for a base to be established close to the Russian border. Ousted President Yanukovych favoured continued trade deals with Russia because he is an ethnic Russian as are the majority of the population in Eastern Ukraine. Obama wants Ukraine to join the EU so he favoured trade deals with the West as that would see a significant move forward to Ukraine joining NATO. This is the crux of the subsequent violent uprising. The shooters in the square firing at the people ? Confirmed to have been the same neo-nazi groups receiving US funding, not the Ukrainian military. This was also confirmed by foreign ministers of other eastern European countries. The mis-reporting of this key fact is what turned ‘hearts and minds’ against Yanukovych. Yankukovich, the democratically elected President of the Ukraine, was thrown out by coup. Under the terms of Ukraine’s own constitution this is illegal. William Hague lies in the House of Commons telling MP’s the revolt is legal, democratic and just. The subsequent election in Ukraine did not include giving a vote to certain ethnic Russian areas of Eastern Ukraine. Most of the refugees fleeing conflict areas were ethnic Russians crossing the border into Russia itself. There are many other incidents in this situation that happened but have not been reported that I won’t subject you to, but suffice to say the overwhelming narrative here in the UK is that it’s Putin and his puppet Yanukovich that caused the aggression. It just goes to illustrate that if the UK government feels that they can get away with it, which is pretty much all the time, then the press will usually play ball, especially the BBC, in spinning a pro-UK govt. line. The sad thing is that this will placate much of the UK public who have been generally become dis-interested in politics and are happy going along with the myths of yesteryear and whatever headline they spot in the newspaper.